With Colombian Duvan Zapata at the double, Atalanta eliminates Cristiano Ronaldo’s Juventus from Coppa Italia at the Atleti Azzurri Stadium. Colombian striker Duvan Zapata is on fire with Atalanta this season in all competitions, the striker just eliminated Cristiano Ronaldo’s Juventus from the Coppa Italia with a brace and finished with any dreams of winning the treble with the Vecchia Signora on his first season. The Italian champions were coming from a five-consecutive Coppa Italia wins and they were expected to easily defeat La Dea but they weren’t counting on the Colombian striker who has already scored 17 goals on his last 10 matches in all competitions with his club. The first half started with a very interesting development as defender Giorgio Chiellini fell injured before the 30th-minute mark, he had to leave the pitch and Joao Cancelo took his place in the back line defense. This was ultimately a massive reason why Atalante was able to penetrate Juventus’ defense with relative ease, the local squad also stopped Cristiano Ronaldo’s efforts completely and they saw him get increasingly frustrated because he wasn’t able to connect with any of his teammates throughout the whole 90 minutes. After a few missed opportunities by Juventus and injured Chiellini watching from the bench, Belgian left-back Timothy Castagne jump started Atalanta’s massive feat with a beautiful long-range shot that goalkeeper Wojciech Szczęsny wasn’t able to save. But Duvan Zapata’s personal show hadn’t even started yet, the striker took a ball with his back against the goal and with a single move he stood in front of the goalkeeper to send a potent well-placed strike that signified the second goal for Atalanta. 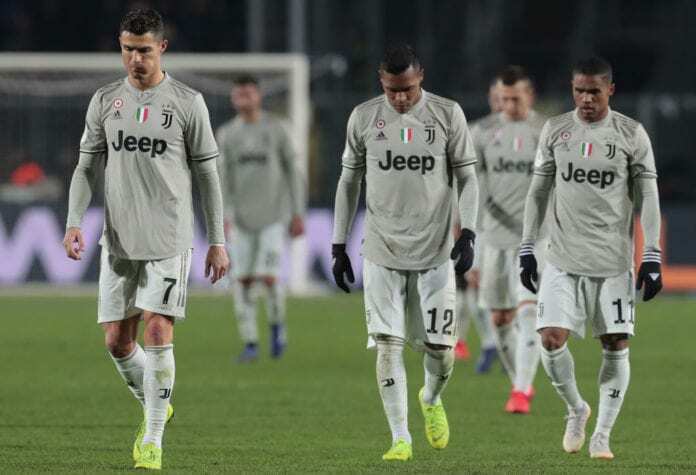 The first half came to an end with all Juventus players completely shocked for what they were experiencing, you could see their faces didn’t believe their bad fortune and they suddenly realized that getting eliminated was actually a possibility. Cristiano Ronaldo arrived to improve Juventus’ level of performance, but he was nowhere to be seen this Wednesday at the Stadio Atleti Azzurri d’Italia in Bergamo. Every single time he approached the box, at least two defenders came after him to press him in order to prevent him from either sending a pass or taking a shot on goal. The second half was more of the same, the Atalanta fans were incredibly supportive with their squad this evening because they knew that they were close to making history against one of the most dominant clubs in Italian football history. All Giampiero Gasperini’s players needed was for his players to hold the result for another 45 minutes and they were going to go through to the Coppa Italia’s semifinals. The major game decider was none other than Duvan Zapata, the striker was able to create discomfort in Juventus’ defense near the end of the match and he could steal a ball with a clear advantage and only Wojciech Szczęsny to stop him. The South American striker confirmed that he currently is one of the top players in Italian football, several major clubs will come after him during the summer transfer window and Sampdoria will make serious bank when they sell him to the highest bidder. Being the man who eliminated the powerful Juventus is more than enough for his market value to go through the roof, but his overall season is turning up quite impressive as well for La Dea. What do you think about Juventus getting eliminated by Atalanta y Coppa Italia? Please share your opinion in the comment section down below.